An extension lead (also called an extension cable or extension cord) is a length of power cable with one or more sockets at one end and a plug at the other end. Electrical extension leads allow you to use appliances at a greater distance from the mains power socket than the integrated cable within the device. They effectively extend the length of the power cable. Extension leads can have numerous sockets and are able to power multiple devices from just one mains socket. What type of extension leads are there? Single extension leads – Single extension leads only have one socket and are commonly used to provide power to a part of the room where there is no power outlet. They must never be combined in series with other extension sockets or multi socket adaptors. Multi socket extension leads – Multi socket extension leads sometimes referred to as multi gang extension leads have more than one socket (or gang). They can be used to power multiple devices and increase the number of plugs that can be connected to one mains socket. Cable reels – Cable reels have one or more sockets or gangs. Cable reel extension sockets allow you to power devices from a much greater distance. Their cable length typically ranges from a couple of metres up to 100 metres. The cable is supplied on a reel with integrated sockets. The use of a reel makes it easier to store and transport the extension lead. Some models feature an auto-rewind function so you dont need to manually wind the cable back in after use. 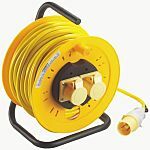 Some cable reel extension leads also feature built in RCDs (residual current devices) that prevent electrical shocks if there is a fault.  Extension leads must not be plugged into one another or used in series. This can cause the socket to overload.  Dont overload sockets by plugging in appliances that exceed the maximum current rating.  If extension lead cables are in areas where they could be a hazard, you should fix the cable down or cover it with a protective rubber strip.  When using cable reels, you must unwind the full length of the cable to prevent overheating. IP Rating: An IP (Ingress Protection) rating defines how effective an electrical enclosure seals against foreign bodies. Surge protection: Surge protection functionality protects the unit and attached appliances from voltage spikes. Switched Sockets: Some models come with option to turn individual sockets on and off.